Gifts for Sister: Sending gifts to your sister can be a tedious task. There are always lot of options to select from. Apparels and accessories make a great gift during Diwali since people shop for new ones always during the festive season. 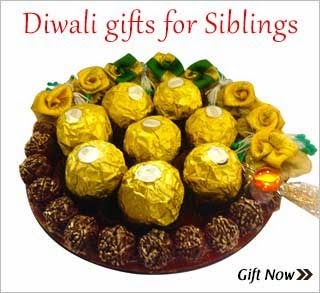 Chocolate hampers, Dryfruits , snacks and mithai hampers also make great gifts for Diwali. If your sister is young then gifting her toys or a box of chocolates would be great. Gifts for Brother: Many people stay away from their families and at such time sending gifts to their siblings and kids becomes very important during festivals. You can send your brother gourmet hampers full of sweets, dryfruits , namkeen, chocolates and lots more. For Bhaidooj you can send him, pooja thalis with tikka and something that he always wanted like electronics, mobiles, apparel, etc. You can view a separate gifting collection for Laxmi Puja, Bhaidooj, Dhanetras. Gifting catalogue ranges from diwali diyas and candles, gift sets, puja thalis and idols of gods, dryfurit and mithai hampers and lots more.